Earn up to 16,792 reward points. A modern digital piano with an exceptional grand sound and feel. 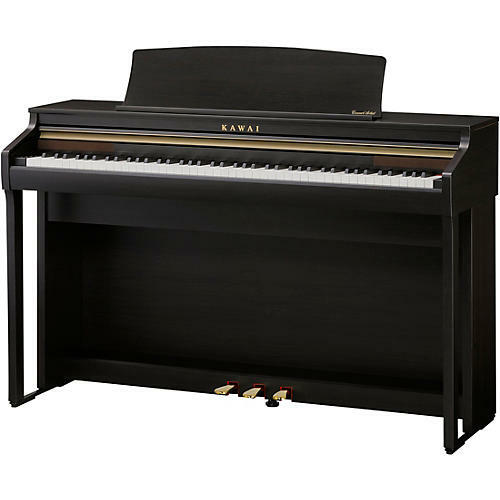 Featuring the brand new Grand Feel Compact wooden-key keyboard action, beautiful SK-EX and EX concert grand piano sounds, and modern Bluetooth connectivity, the piano-focused CA48 offers many of the strengths of the premium Concert Artist models in a more compact and affordable package. The CA48 utilizes the brand new Grand Feel Compact wooden-key keyboard action. The GF Compact action has been designed to reproduce the authentic touch weight characteristics of Kawai's industry-leading Grand Feel keyboard actions in a smaller size. The rich, expressive sound of the Shigeru Kawai SK-EX and Kawai EX concert grand pianos is at the heart of the CA48. Both pianos are faithfully reproduced with full 88-key sampling using advanced Harmonic Imaging sound technology, to establish a new standard in digital piano tonal quality. Supplementing the beautiful acoustic piano voices, the CA48 also features a modest selection of additional sounds, ranging from electric pianos and drawbar or church organs to strings, human choirs, and synth pads, inviting musicians to add greater variety to their performances. In addition to standard USB and MIDI jacks for connecting to computers or other instruments, the CA48 digital piano also features integrated Bluetooth® MIDI technology that allows it to communicate with supported smart devices wirelessly. Once paired with a phone, tablet, or laptop, CA48 owners can enjoy a wide variety of exciting music-related apps that enhance their learning and playing experience. The knowledge and skill of an experienced piano technician are essential to bring out the best of a fine acoustic piano. In addition to tuning, the technician also performs numerous regulation and voicing adjustments. The CA48’s Virtual Technician ‘Smart Mode’ simulates these refinements digitally, with ten preset configurations that intelligently adjust various characteristics of the grand piano to match different musical styles. The CA48 features three pedals – soft, sostenuto, and damper (with half-damper capability). The new Grand Feel Pedal System accurately replicates the position and individual weighting of the damper, soft, and sostenuto pedals of a Shigeru Kawai SK-EX concert grand piano to further enhance the CA48’s acoustic piano-like authenticity. The CA48’s Spatial Headphone Sound (SHS) technology enhances the depth and realism of the instrument’s sound when listening through headphones or earphones. The player can select one of three different acoustic presets that adjust the spatial positioning of the sound, while also helping to reduce auditory fatigue when using earphones or headphones for extended periods of time. A concert grand experience in the comfort of your home.